The result wasn't a scathing attack on business-as-usual, nor a rubber-stamp for the eXtreme Programming or Scrum. It was a simple statement of values. The statement of values is important because the practices without the values are empty. If a company is devoted to following a plan, fighting changes to scope or priority, purchasing expensive and opinionated tools, following a rigid process, and producing copious documentation then that company certainly may continue to do so. It may even be successful. But it will not be agile. 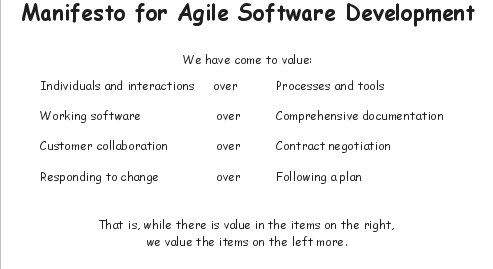 In fact, such a company should not waste time and money attempting to adopt an agile process. Agile is for companies devoted to simplicity, iterative development, time-to-market, and quality. Failing to adopt the values is the first and greatest failure mode.